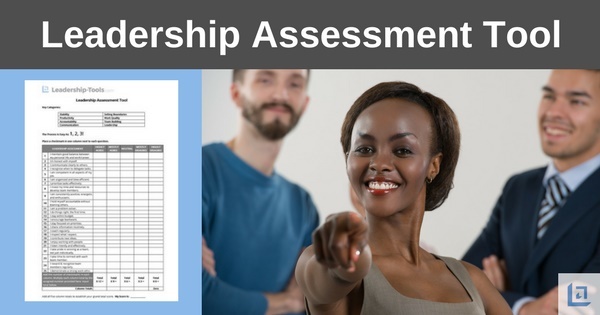 The Leadership Assessment tool is designed to provide you with a high level assessment of your leadership effectiveness. Individuals seeking to learn and grow in their leadership roles can quickly identify strengths and areas requiring addition leadership development. This free tool is particularly helpful to people who are in the initial phases of their management careers, new to leadership, or if they are currently struggling in their current leadership position. 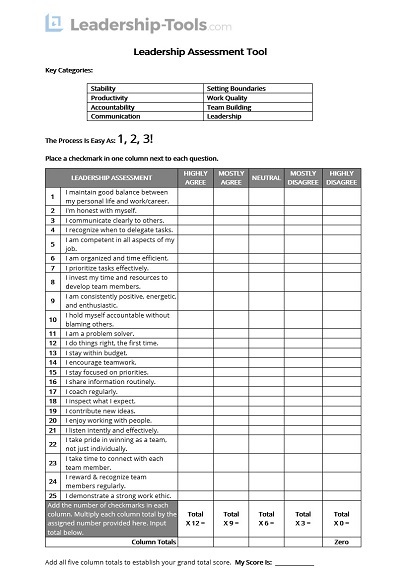 Students and athletes, or anyone who has the responsibility of leading others, can benefit from completing this leadership assessment. Once you have reviewed the results of this leadership assessment you want to pursue a deeper analysis of your leadership skill-set. You can use our 360 Degree Feedback Leadership Survey for this purpose. Both assessments take into consideration a broad range of leadership competencies. Participants will gain valuable insights as they identify strengths, opportunities for improvement, and areas for continued learning. In the end, participants can utilize these insights to create a leadership lesson plan for continued leadership skill training and professional growth. As you consider completing our leadership assessment, keep in mind that effective leaders inspire others to step out of their comfort zone. Leaders encourage us to continue to learn and grow, so as a leader, it's important that you do the same. The traditional manager who maintains the same old routine and plans his or her day according to what's expected or the "status quo", leaves too much opportunity on the table. If you're in this kind of rut, then for the sake of the people you lead, and yourself, it's time to do something different! The business and leadership challenges of today and tomorrow will always revolve around change, innovation, passion and creativity. This simple leadership evaluation will help you to enjoy greater business success, through ongoing leadership skill training and self development. What has worked successfully in the past may or may not continue to provide best-in-class results. Therefore, change and personal growth are healthy necessities that leaders should embrace. "Most of what we call 'management' consists of making it difficult for people to get their work done." Our leadership analysis identifies 25 key skills that define your leadership potential. This tool identifies your areas of strength and skills requiring improvement. After completing the questionnaire, the tool will provide feedback that is only as good as the quality of your answers. To ensure the best results, provide honest and direct answers so you can identify the skills you should celebrate, as well as those that you need to work on. Stability: leaders who demonstrate self-awareness, control and emotional stability provide calm when thing are hectic. Setting Boundaries: establishing clear expectations, providing 'guard rails' for personal and professional behavior in the workplace. Productivity: understanding the difference between working hard (or appearing busy), versus being productive and achieving quality results. Work Quality: consistently holding yourself and team members accountable for a quality product; doing thing to a complete finish - doing it once, and doing it right, in order to ensure quality while minimizing wasted time and effort. Accountability: taking complete ownership in the decisions you make as a leader, and setting an example for your team to emulate. Team Building: emphasizing that no one alone is as good; as smart; as productive; as outstanding, as the entire team is collectively. Investing in the team is an investment in the future success of the organization. Accountability: an effective leader holds himself to a higher level of accountability than the rest of the team. Leaders must set the tone for the behavior and results they expect from their team members. This quick assessment takes three simple steps. Complete the assessment: If some questions don't quite fit with your circumstance, feel free to make minor changes to the questions. Stay within the "spirit" of the question. Do not skip questions or the scoring of the assessment won't reflect a clear outcome. Calculate each column total: Add the number of check marks in each column and enter the total at the bottom of each column. Add the column totals for your final score: Add all five column totals to establish your grand total score. Review the score ranges and related feedback provided at the bottom of the assessment to read your results. Individuals scoring highly should focus on coaching team members, sharing their knowledge to create more leaders within the organization. You also may be instructed to work to fine-tune the areas of leadership needing additional attention. Your assessment may also indicate that your skill-set can be significantly improved by establishing personal and professional development goals. Ask your immediate supervisor or Human Resource (HR) partner to determine what tools and resources are available to support you in your goal setting efforts. You can also use our Life Balance and Master Action Plan (M.A.P.) tools for goal planning. To download our free Leadership Assessment tool, simply subscribe to our free newsletter. You will immediately receive a password that grants access to our entire leadership tools library.